Feltham was an urban district in Middlesex, England from 1904 to 1965. 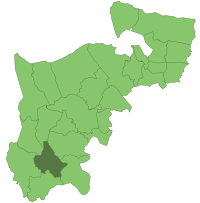 It was based on the parish of Feltham, which had previously been part of the Staines Rural District. In 1930, the Rural District was disbanded, and the parishes of East Bedfont and Hanworth added to Feltham. It was abolished under the London Government Act 1963, in 1965, to form part of the new London Borough of Hounslow, in Greater London. The district's coat of arms, granted in 1945, was: Per fess wavy argent and azure in chief two palets sable between a Tudor rose stalked, slipped and leaved proper and a peacock in his pride vert and in base in front of two wings conjoined of the first a sword erect or. The crest was: On a wreath of the colours within a chaplet of hawthorn fructed proper a mount of pellets thereon an eagle wings expanded or. The wavy line and the silver and blue field represent the Duke of Northumberland's River which takes the head-waters of the River Colne to Syon House, and the Longford River (also called the Queen's or Cardinal's River) which takes the Colne Waters to serve the fountain and lakes of Hampton Court Palace. The two black palets represent railway lines and indicate Feltham's importance in the southern portion of the British Railways system. (See Feltham marshalling yard). The rose stands for the Tudor associations of Hanworth, particularly the claim that Elizabeth I spent much of her early childhood at Hanworth Manor. The peacock represents the topiary peacocks in the grounds of St Mary's Church, Bedfont, which are accepted as local emblems. The winged sword stands for London Airport and the district's close association with the aircraft industry. The sword also refers to the Royal Army Ordnance Depot, and to the ancient sword-mill marked on a 17th-century map. The gunstones also allude to the R.A.O.C. Depot, and to the powder mills which formerly existed in the Crane Valley. The hawthorn refers to the Spelthorne Hundred, and the eagle is a reference not only of air traffic, but also of the old Roman road to the west which passed through the district. 1 2 "Feltham Coat of Arms". Heraldry of the World. Retrieved 16 April 2015. This article is issued from Wikipedia - version of the 8/18/2015. The text is available under the Creative Commons Attribution/Share Alike but additional terms may apply for the media files.